Eoghan Lordan, a Gaeilgóir, analyses the apathy commonly directed towards the Irish language. September was an interesting month for the Irish language. At the beginning of the month here in Cork, many people were outraged at the news that a barman from the Corca Dhuibhne Gaeltacht in Kerry, Cormac Ó Bruic, felt he had no option but to quit his job at the Flying Enterprise establishment because he was not permitted to speak Irish to a colleague while working there. Last week, Irish speakers were again incensed when a referee at a Galway Junior A Championship match between Ros Muc team Na Piarsiagh and Galway city side Salthill Knocknacarra told the Ros Muc players and officials to stop speaking Irish to each other. On second thoughts though, interesting might not be the best way to describe those events. Typical would be a better word. Classic. Stale. I mean, talk about an Irish situation. The right of people to speak either official language they choose, either Irish or English, is once again disregarded and bar a week or two of protests and Facebook comments, the whole episode is forgotten again. Sound familiar? Yes. It’s the same approach that has existed around the use of the Irish language for far too long now. What was different about the events of this month though was that this time, for once, the State wasn’t actually at fault. While the State may be held accountable when it fails to provide translations of official legislation and documents, or when someone is unable to engage with a branch of the State, such as the Gardaí, through Irish, the State cannot be held responsible for overseeing the conduct of every bar owner and referee in the country – that would be absurd. What was at play here, to put it bluntly, was the classic, begrudging attitude that unfortunately is typical of so many Irish people. 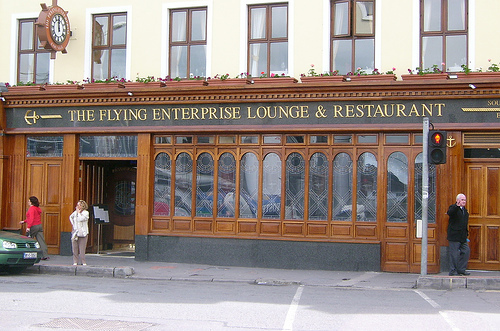 The owners of the Flying Enterprise Bar, to their credit, were not at fault – acting in response to complaints made by some customers, the HR department of the Flying Enterprise informed Mr Ó Bruic that the language used while working in the bar was that of the majority, English, and that all other languages, including Irish, had to be left outside the door. The people at fault here, as in the case of the Ros Muc v Salthill Knocknacarra Junior B game, were those that felt it necessary to complain about the use of Irish as a vernacular by bar staff or by Gaelic footballers. Ignoring the very obvious 1916-2016 connotations, as well as the irony that in the “Republic” of “Ireland,” people are not free to speak the Irish language whenever they choose to do so, these two stories are a very poor reflection on the state of our country at present. Limited as its use may be to muintir na Gaeltachta and to those fortunate enough to have received good primary and secondary schooling trí mheán na Gaeilge, it is factually incorrect to say that Irish is not a vernacular or that it is a dead language. From having been a member of UCC’s Irish Language society, an Chuallacht, throughout my time in college and having taught Irish as a ceannaire/teaching assistant in Cork, Kerry, Galway and in the US, I can unequivocally state from personal experience that Irish is still spoken commonly among young people, and unfortunately for the critics, will probably continue to be so. The Irish spoken may not be as pure as that of Dara Ó Cinnéide or Máire Treasa Ní Dhubhghaill, and it may borrow significantly from English, but what of it? Every language borrows and develops organically from others – just compare English to German and French as proof of that interlinkage. The Irish spoken by young people in Ireland may not be 100% pure, but it most definitely is a pure, honest attempt to maintain an age old Irish tradition and that’s not something that deserves criticism from apathetic “Boys in Green” bandwagon supporters. No one is saying that everyone should speak in Irish all the time, and no one is criticising Irish people for not speaking Irish themselves. For that very reason though, no English-speaking Irish people should criticise other Irish people for their decision to speak Irish. It’s most definitely fair to say that in a world where violence and suffering has become almost normal, the Irish language is not the most important thing; no one denies that. What is being denied of people though, in a subtle way, is the basic freedom to go about their business and do their own thing, without being criticised by others. In every Irish college that I ever worked in, it was always acceptable to use English for matters of importance, such as personal or medical issues. In the supermarket that I used to work in, English was the working language too, but that didn’t prevent Slovak, Polish or any other language from being spoken between workers. And why should it? People conversing with one another in their own language is their business, not yours; so long as customers are dealt with in their language of preference, there really shouldn’t be a problem. It’s sad to think though that in an otherwise liberal 21st century Ireland, for some people, there is a problem.